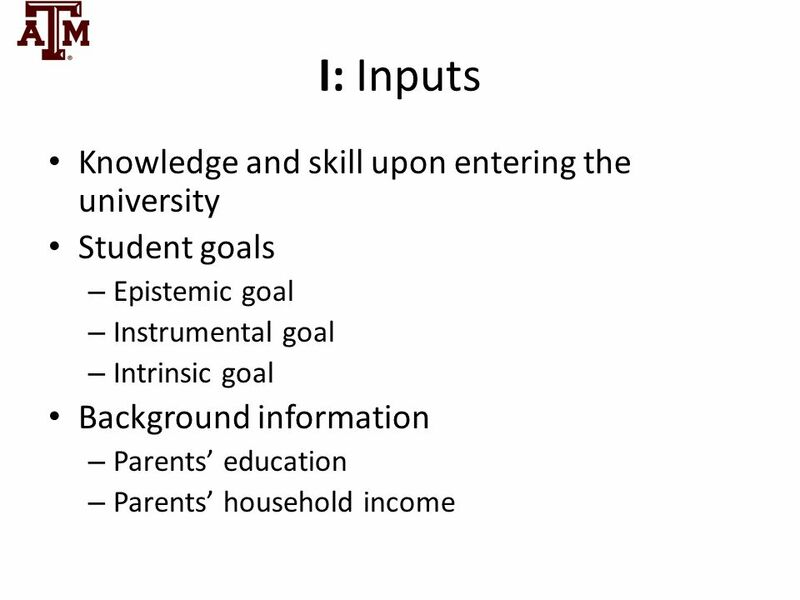 How are these dimensions related? 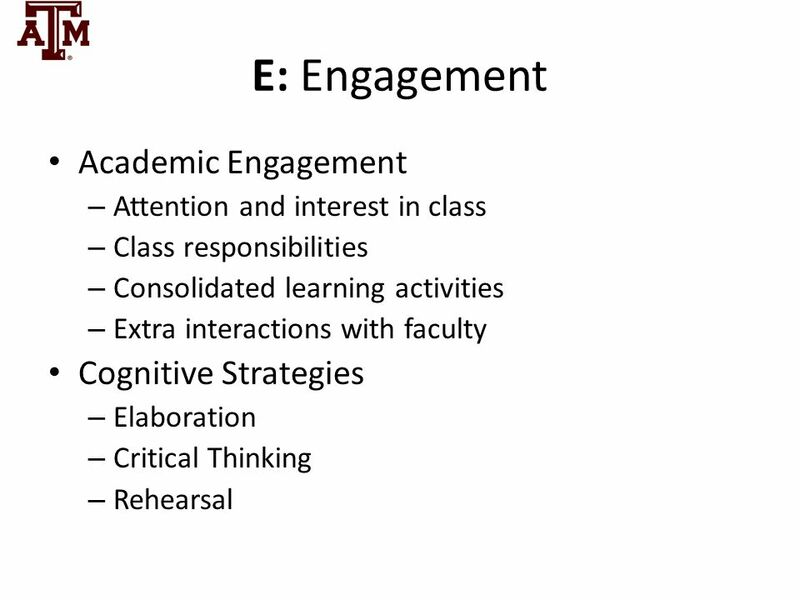 Are some more effective than others at facilitating learning? 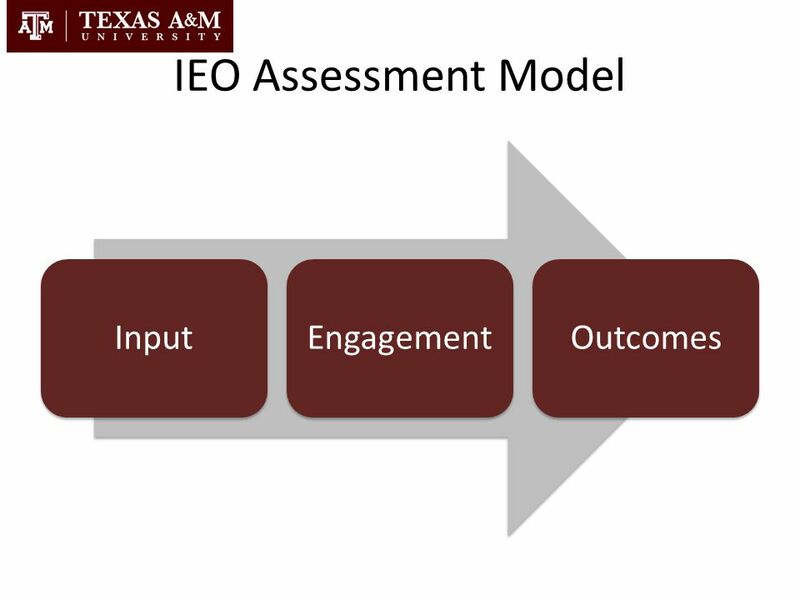 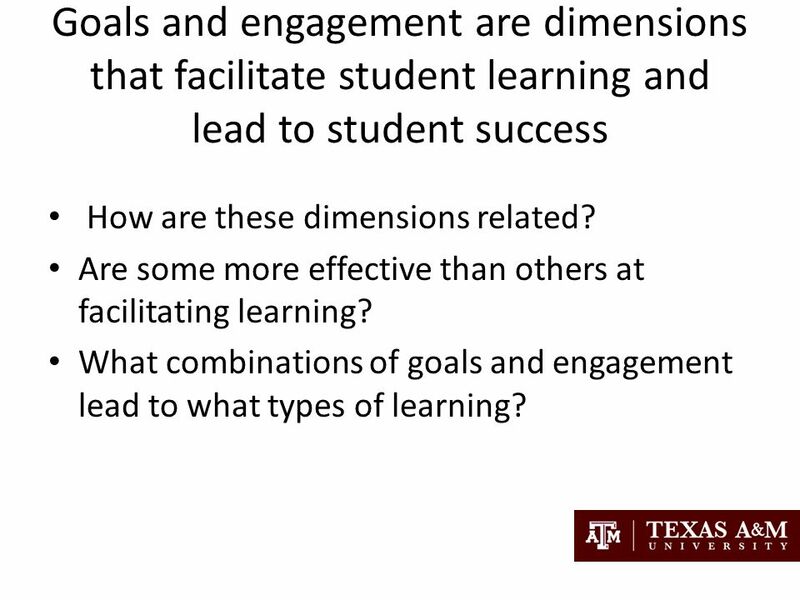 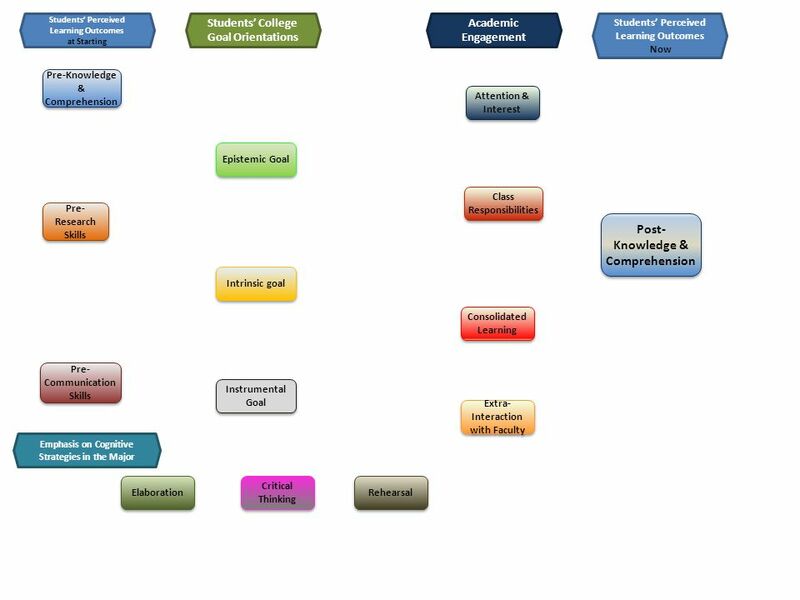 What combinations of goals and engagement lead to what types of learning? 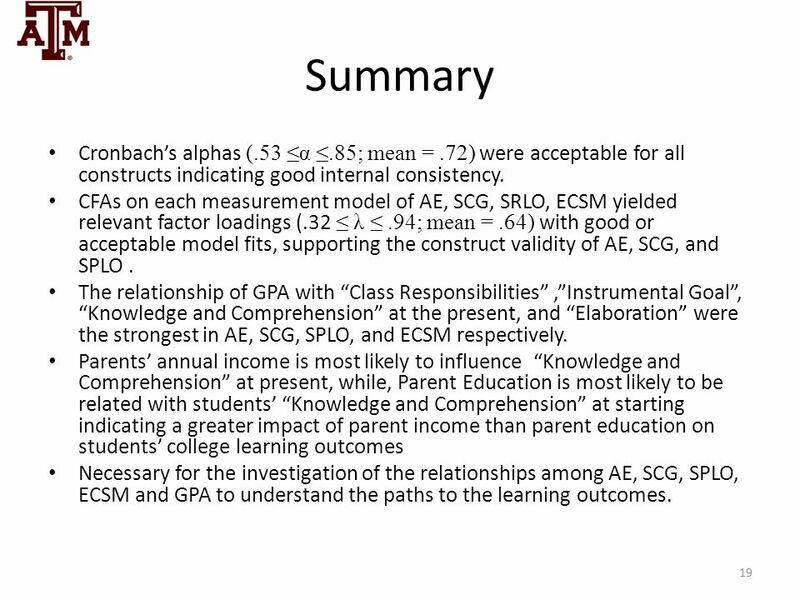 19 Summary Cronbach’s alphas (.53 ≤α ≤.85; mean = .72) were acceptable for all constructs indicating good internal consistency. 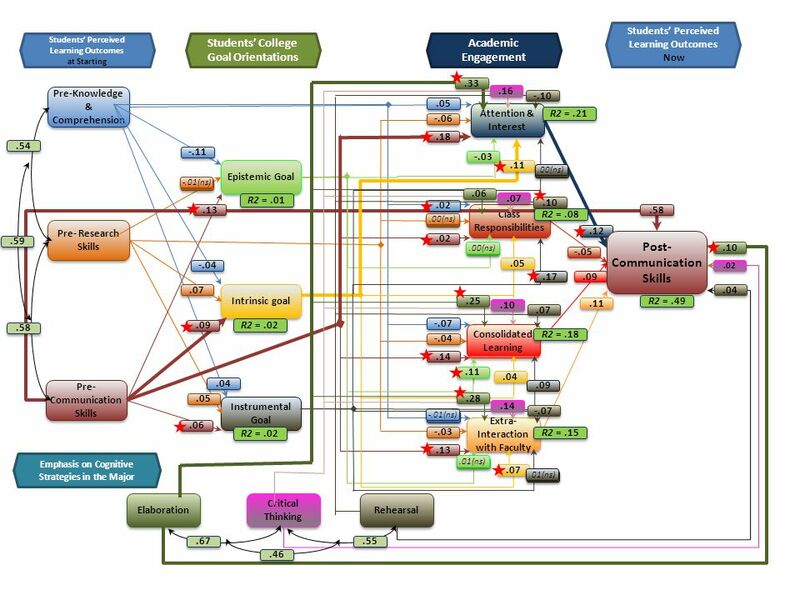 CFAs on each measurement model of AE, SCG, SRLO, ECSM yielded relevant factor loadings (.32 ≤ λ ≤ .94; mean = .64) with good or acceptable model fits, supporting the construct validity of AE, SCG, and SPLO . 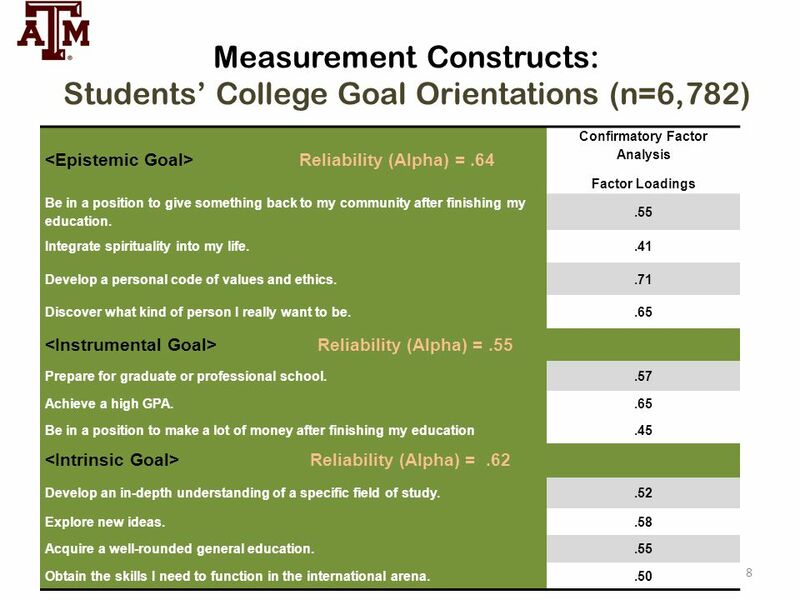 The relationship of GPA with “Class Responsibilities” ,”Instrumental Goal”, “Knowledge and Comprehension” at the present, and “Elaboration” were the strongest in AE, SCG, SPLO, and ECSM respectively. 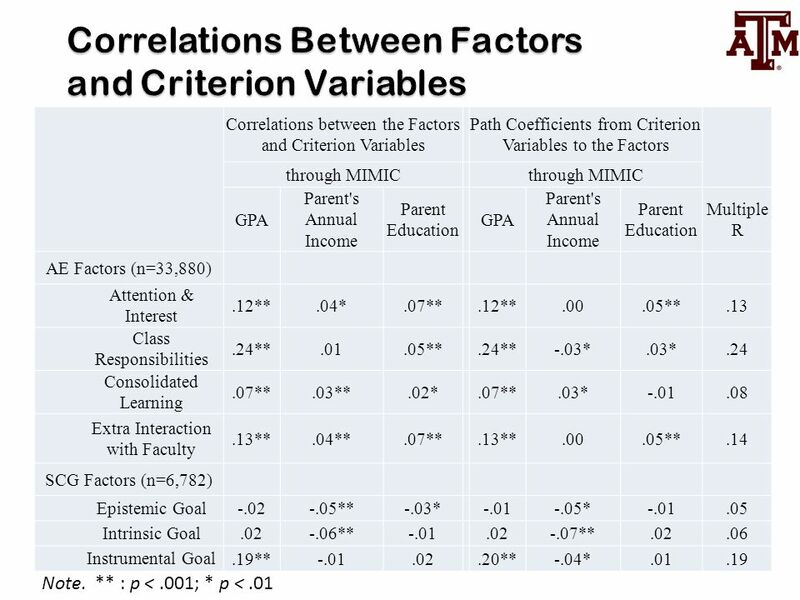 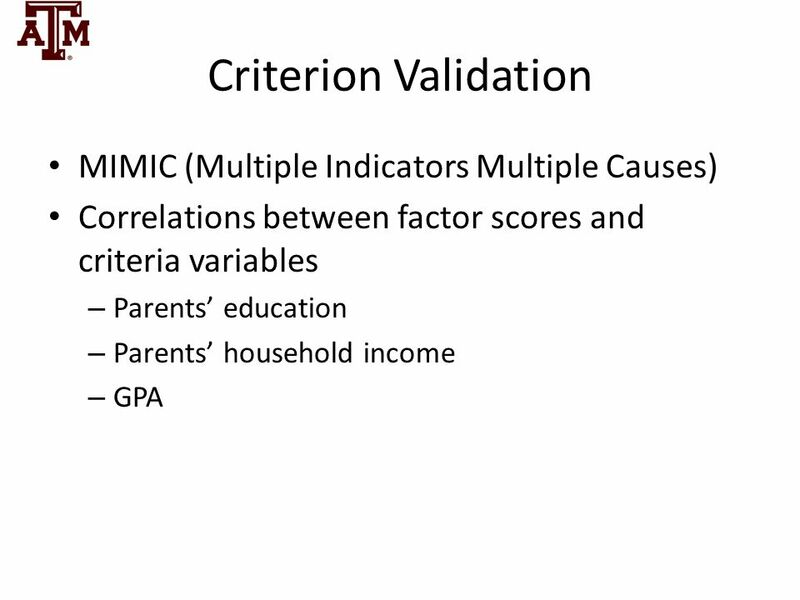 Parents’ annual income is most likely to influence “Knowledge and Comprehension” at present, while, Parent Education is most likely to be related with students’ “Knowledge and Comprehension” at starting indicating a greater impact of parent income than parent education on students’ college learning outcomes Necessary for the investigation of the relationships among AE, SCG, SPLO, ECSM and GPA to understand the paths to the learning outcomes. 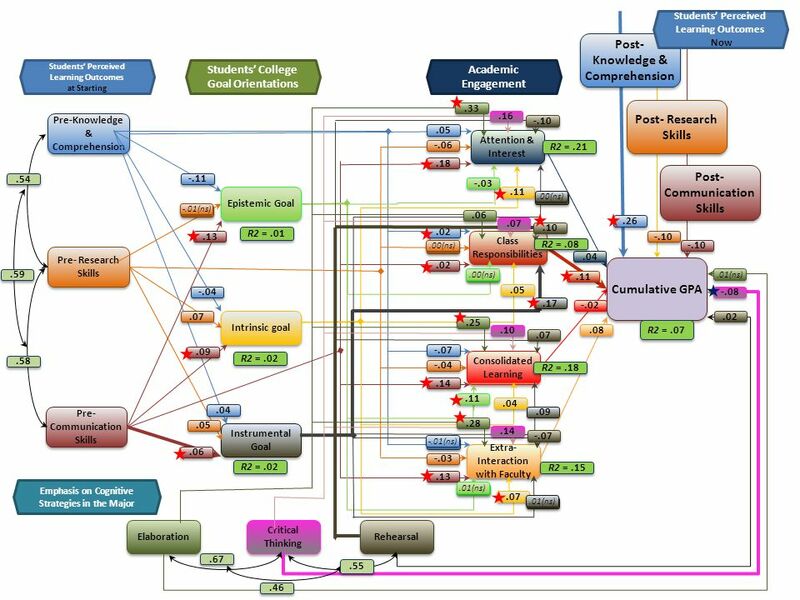 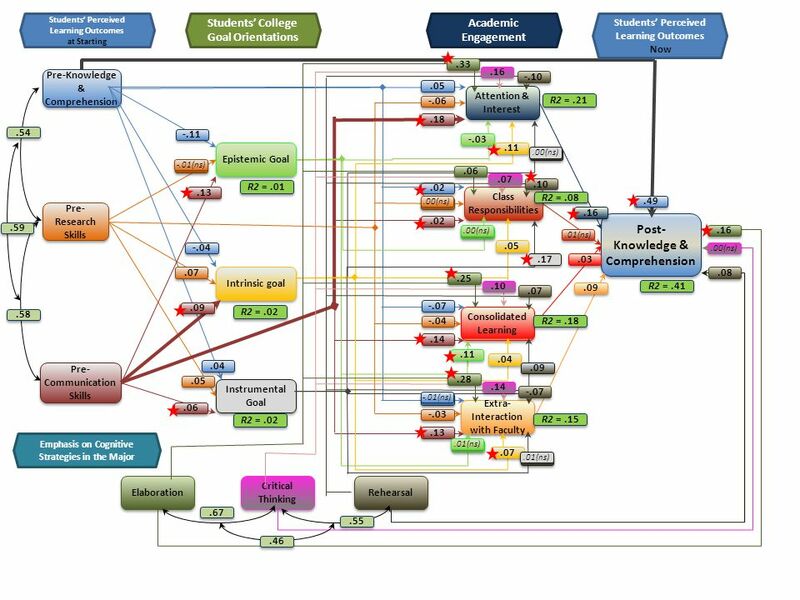 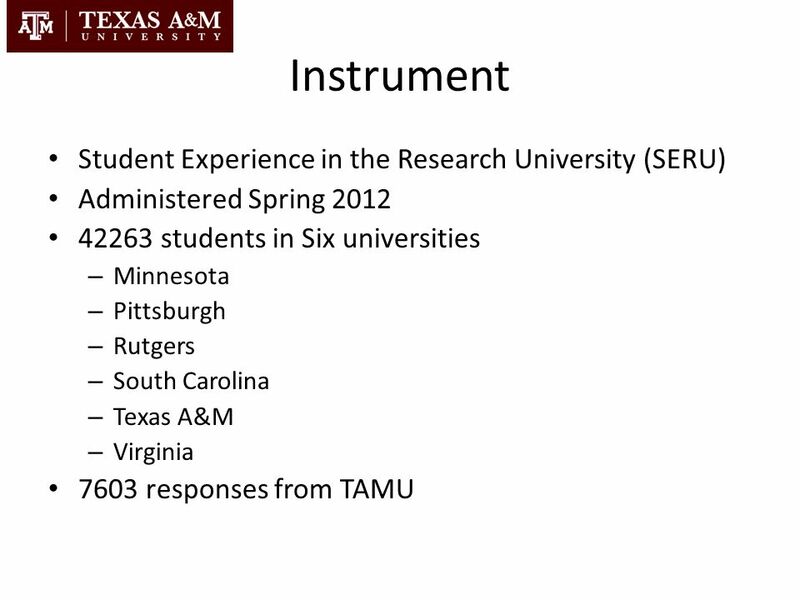 : The Relationships among 5 domains of students’ Self-Reported Constructs and their cumulative GPA through Structural Equation Modeling (SEM) To investigate the relationships among Academic Engagement, Students’ College Goal, Learning Outcomes, and Cognitive Strategies. 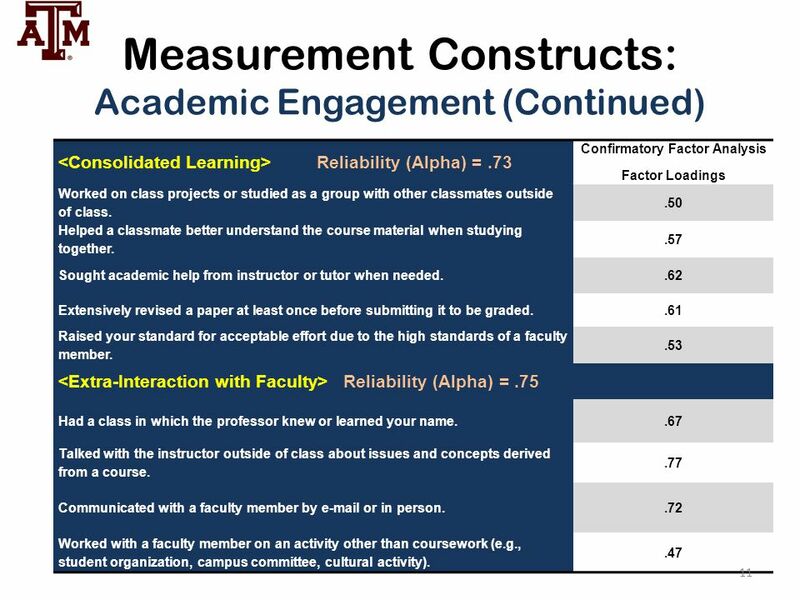 --> How do those constructs lead to each learning outcome including student’s perceived learning outcomes (Knowledge & Comprehension, Research Skills, and communication Skills) and GPA ? 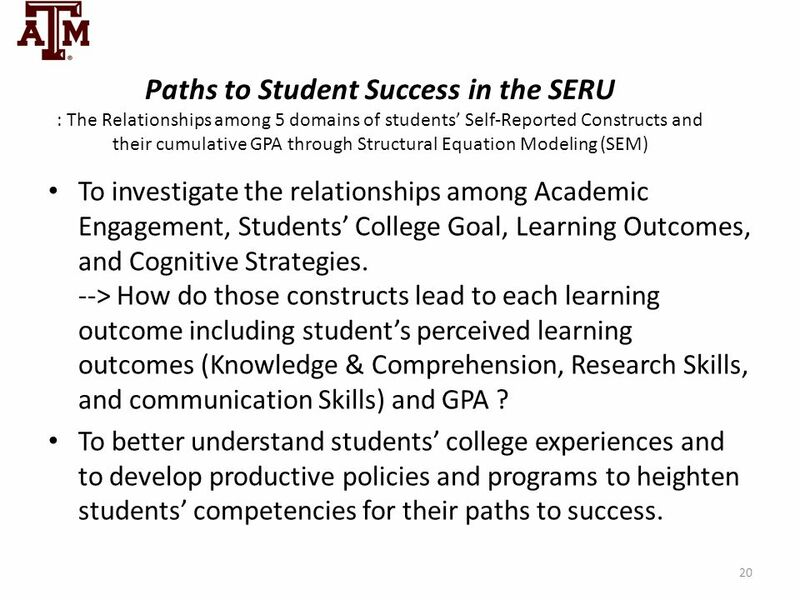 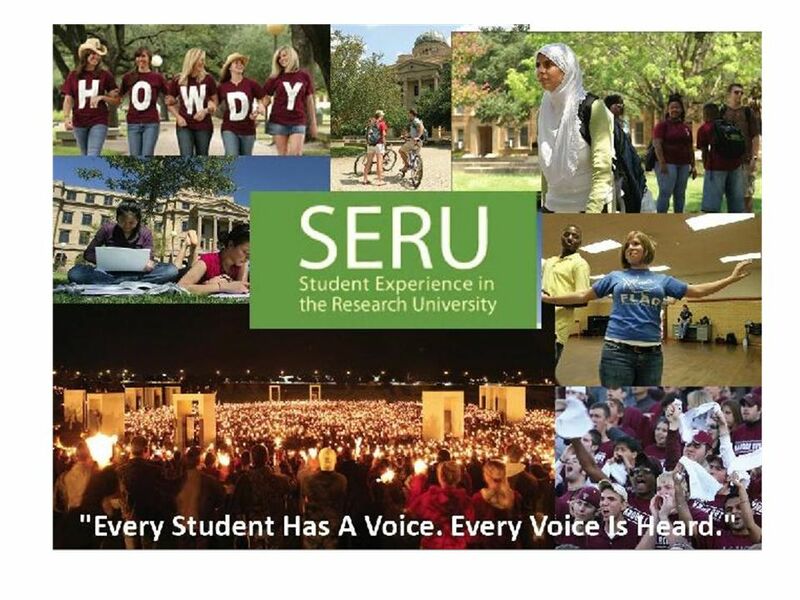 To better understand students’ college experiences and to develop productive policies and programs to heighten students’ competencies for their paths to success. 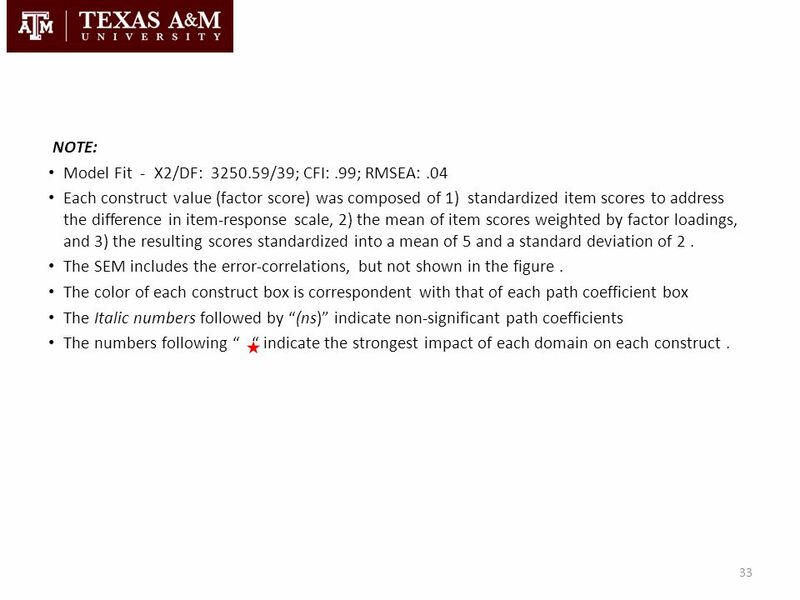 33 NOTE: Model Fit - Χ2/DF: /39; CFI: .99; RMSEA: .04 Each construct value (factor score) was composed of 1) standardized item scores to address the difference in item-response scale, 2) the mean of item scores weighted by factor loadings, and 3) the resulting scores standardized into a mean of 5 and a standard deviation of 2 . 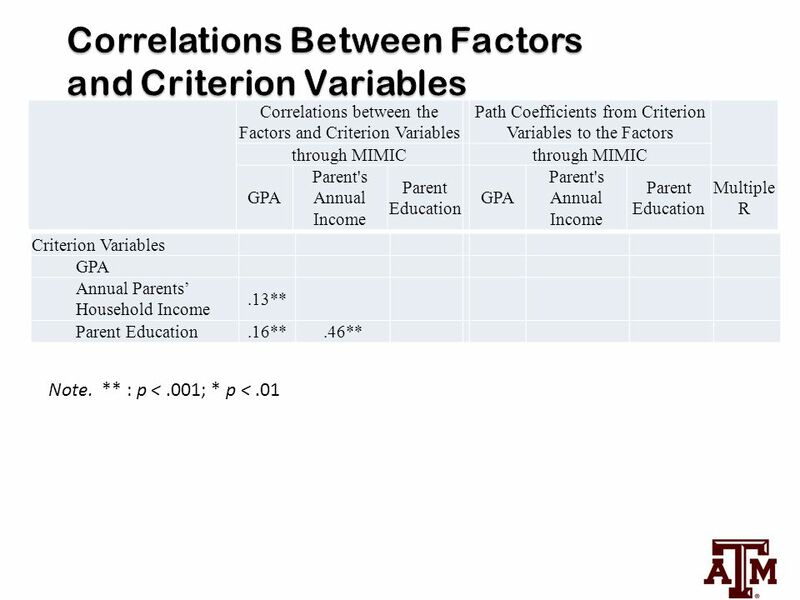 The SEM includes the error-correlations, but not shown in the figure . 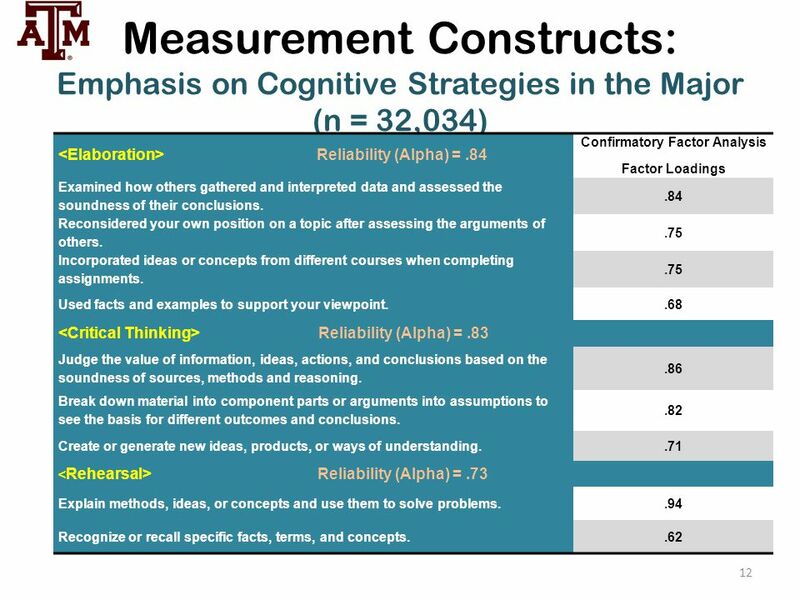 The color of each construct box is correspondent with that of each path coefficient box The Italic numbers followed by “(ns)” indicate non-significant path coefficients The numbers following “ “ indicate the strongest impact of each domain on each construct . 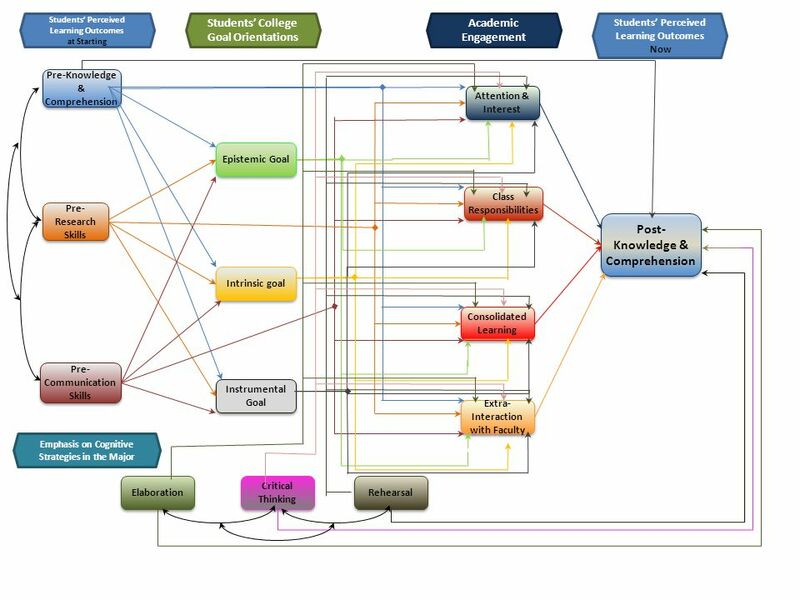 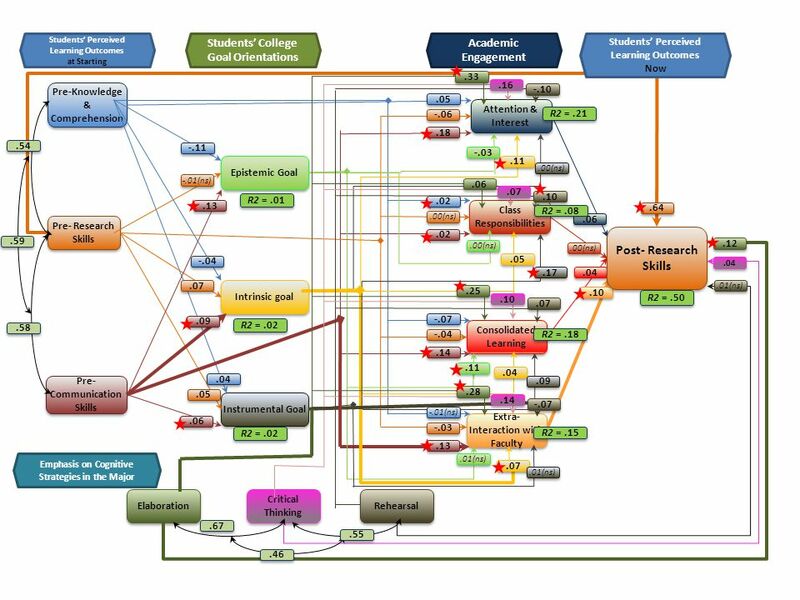 34 Conclusion Structural equation modeling (SEM) yielded several insights into the dimensions that have the greatest impacts on student learning. 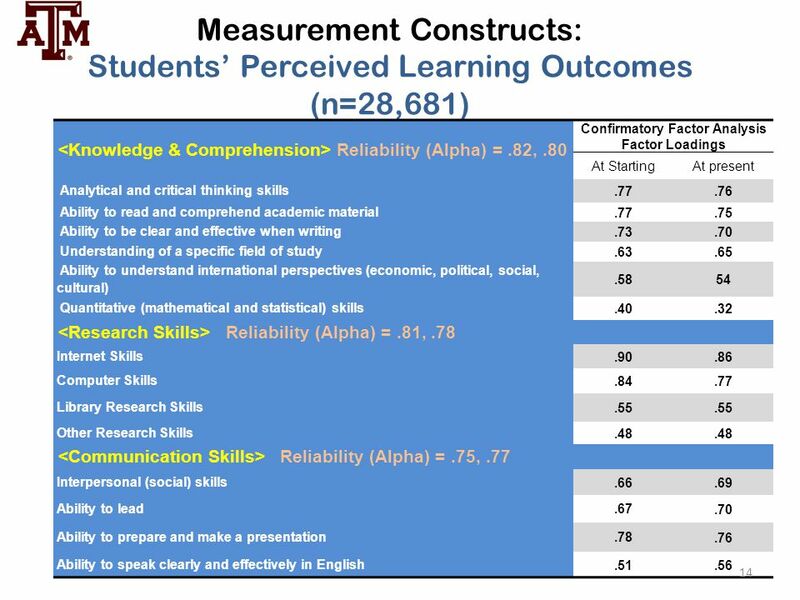 Not surprisingly, for any learning outcome, the student’s incoming ability has the greatest effect on current ability. 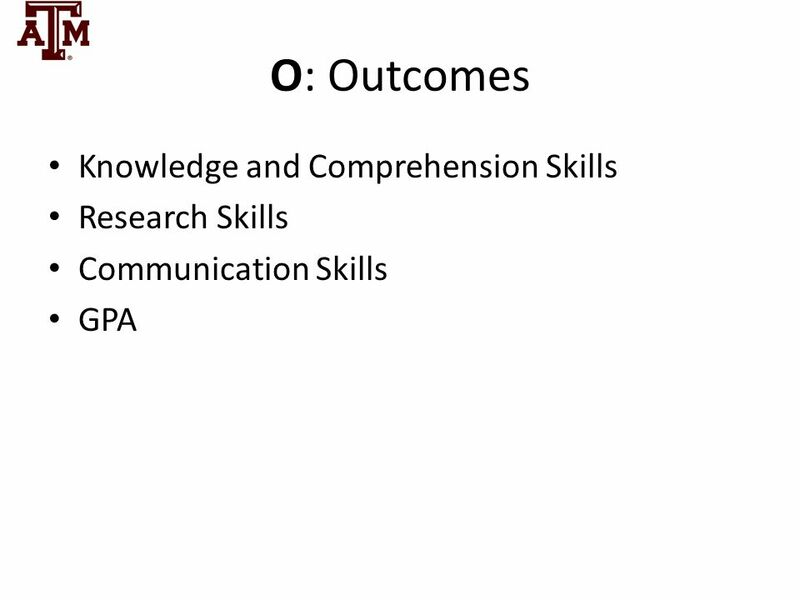 Following that, the greatest effect on “knowledge and comprehension” is found on the path from “pre-communication skills”, to “intrinsic goal”, to “attention and interest in class”, and from “elaboration”. 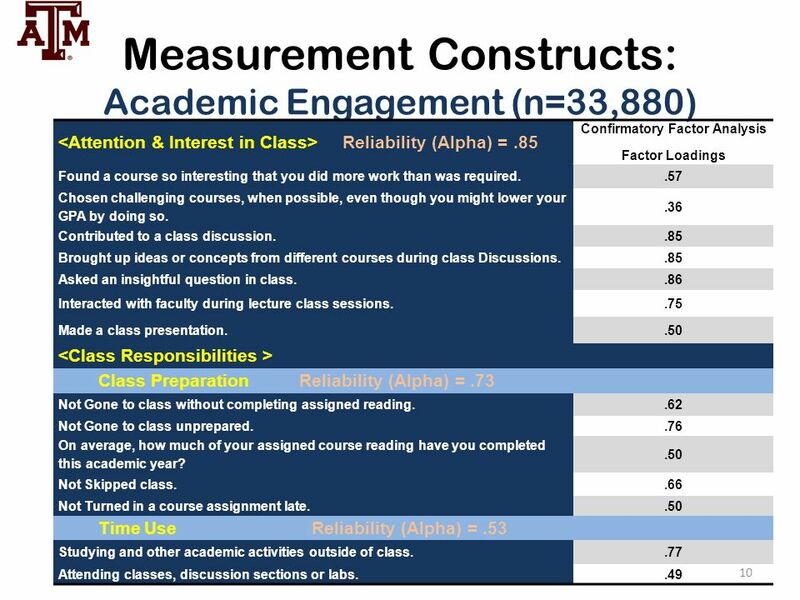 The most important factors leading to GPA were found to be the SPLO of “knowledge and comprehension,” and the AE of “class responsibilities”. 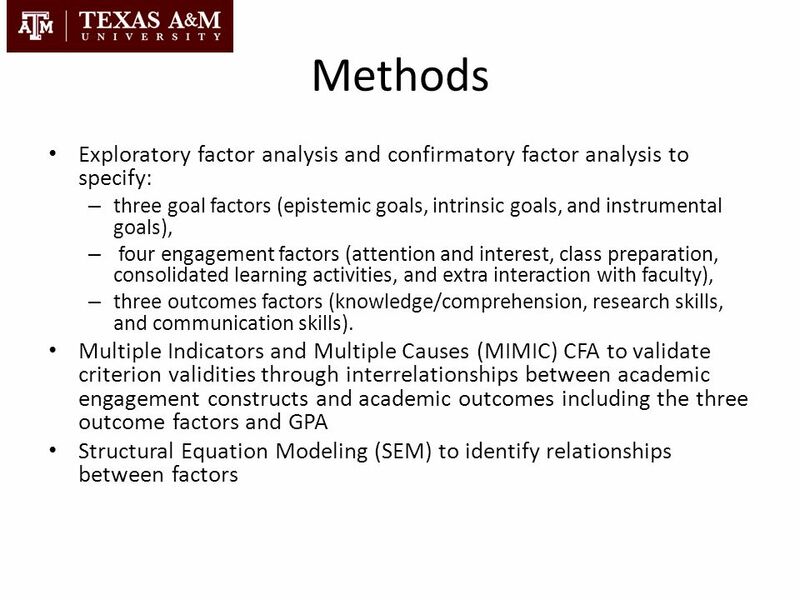 “Elaboration” considered a high level of cognitive strategy did not contribute to GPA. 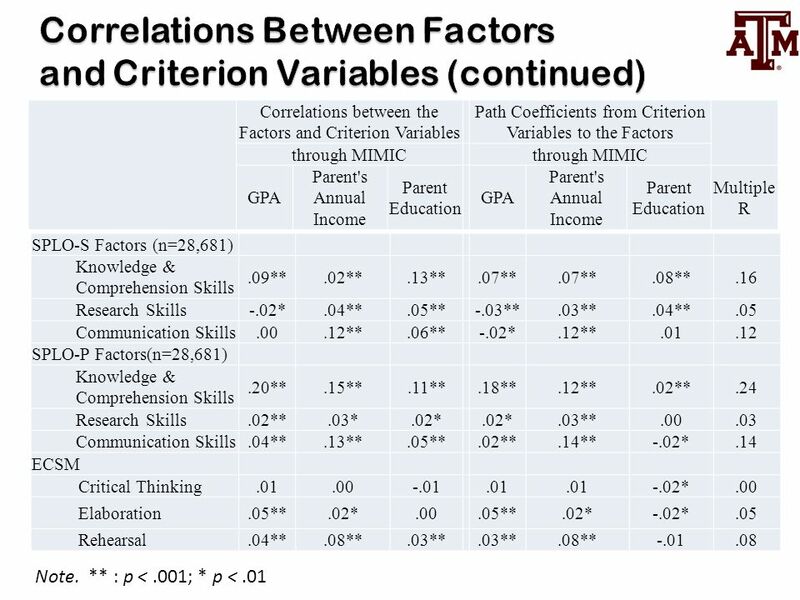 The effect of “critical thinking” on GPA was significant, but negative. 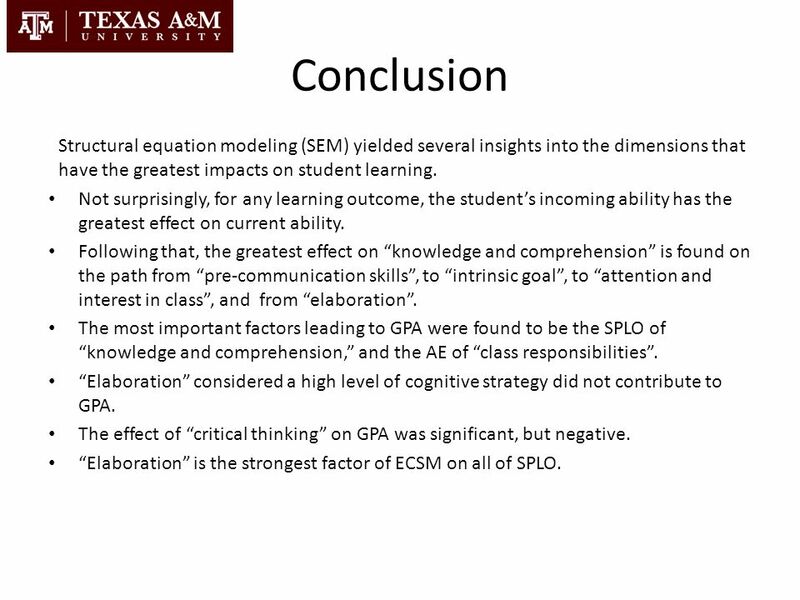 “Elaboration” is the strongest factor of ECSM on all of SPLO. 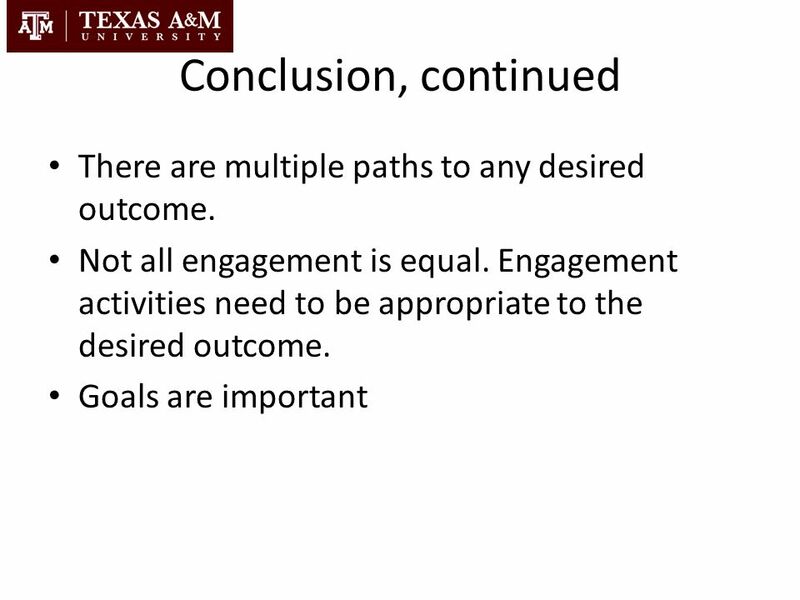 35 Conclusion, continued There are multiple paths to any desired outcome. 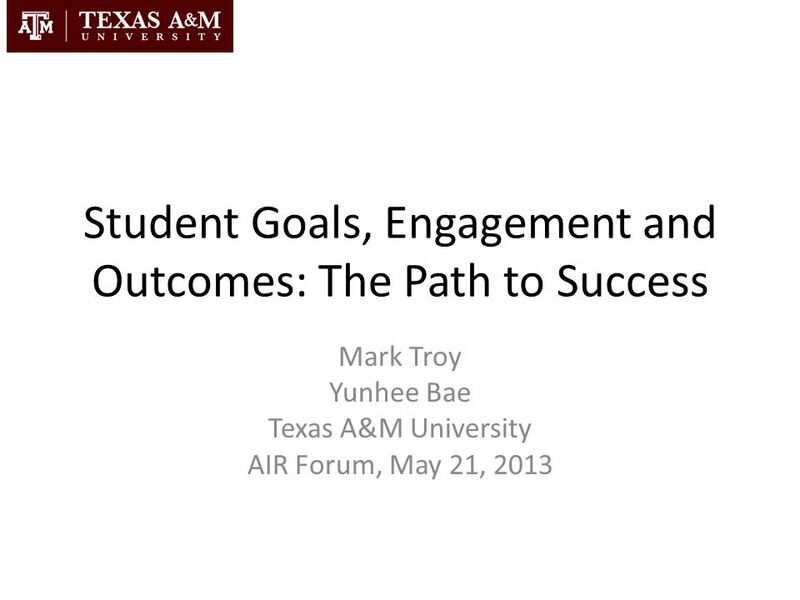 Download ppt "Student Goals, Engagement and Outcomes: The Path to Success"
2.4 Bases de Dados Estudo de Caso. 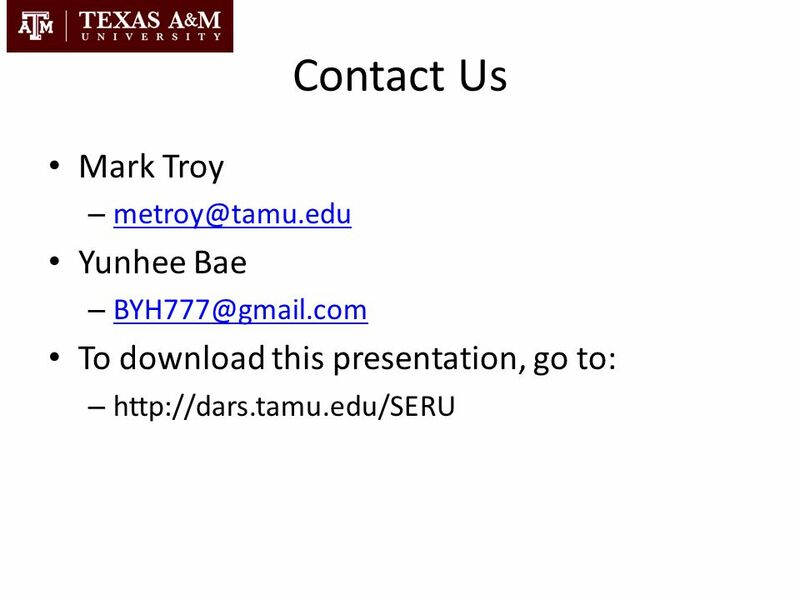 Caso: Caixa Eletrônico Caixa Eletrônico com acesso à Base de Dados; Cada cliente possui:  Um número de cliente  Uma.